For the second year in a row, the Cranberry Township Community Chest (CTCC) and the Cranberry Artists Network (CAN) are partnering on a show in the Cranberry Municipal Building in conjunction with the Cranberry Township Community Days. Now the Community Days outdoor festivities will be on July 13, 14, and 15. But that all kicks off with a special evening on Wednesday, July 12, with the opening reception for the art show, Martinis with Monet. From July 13 through August 10, admission to the show will be free. But the opening reception serves as a fund-raiser for CCTC, and a limited number of tickets are available in advance for $10 through their web site or at the Municipal Building Service Center (with just under a week now left), or for $15 at the door that evening. And I’m thrilled to have had two pieces accepted for this year’s show! One of them is another piece from my latest round of Three Rivers pendants. I didn’t make this one specifically for this show but I had been thinking what I might enter during a discussion of the movement and light in Monet’s art. 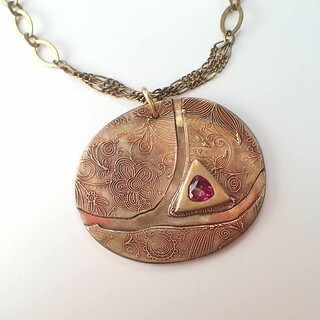 My original design for this piece did include the movement of rivers with the sparkly light of the faceted ruby. But it was the surprising gift from my kiln, of the dappled surface-coloring hinting at sunshine and passing clouds on the ruby-side, that made this piece seem an obvious choice for this show! Because of this side, I’ve titled it, When the Sun Breaks Through the Clouds. 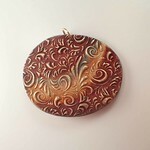 More colors from that kiln-gift are shown in the small, plain photo of the “other” side of that piece. Bronze firings can yield a wide range of surprises: sometimes the results cry out to be polished to a gorgeous, high shine everywhere, while other times they yield a stunning range of colors in random patterns (like this, with an upside-down rainbow in the midst of a crimson field). Though some people report that they find that unpredictability to be off-putting, for me it is part of what makes bronzes so addictive to work with! The colors in the other piece I had accepted for this show come not so much from the firing, but from the underlying colors of various metals, stones, and glass of the piece. I made the focal bead, the one that generated The Artist’s Impression of Warm Blankets as the title of this necklace (Monet –> impressionism: get it?! ), several years ago. 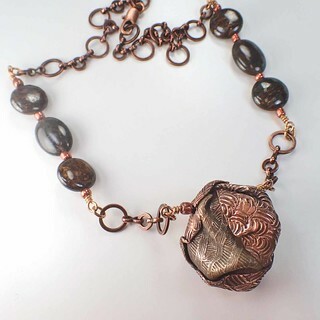 It’s a large, hollow bead, with layers of copper wrapped around rose bronze wrapped around yellow bronze, all with various woven textures. It was originally made as part of a series of exercises exploring the various shrinkage rates of different metal formulas in the construction of hollow structures. As I built it, I was thinking far more about those issues that about its actual design but, as soon as I pulled it out of the kiln, I saw myself pulling a (tiny…) bundle of freshly-washed blankets out of the dryer! Most of the focal beads I made remain just that, the focus of attention, with little to nothing else to distract the viewer’s eye from them. I strung this one on some beading wire, added a clasp, and wore it myself a few times, thinking it needed something else and waiting for it to tell me what it wanted. At a recent bead show, I saw both the stones and the chain, and they immediately reminded me of the features at a cabin I shared years ago with friends on a series of late-autumn trips, where warm blankets were much appreciated as the temperatures dropped at night, and that was it: I’d found what I needed to complete this piece. I sure hope that one or both of these pieces will find someone else’s heart to warm now too! Well, it’s been one of those months…. No crises, just one extra thing after another. Computer problems, car problems, dental problems plus more than the usual number of aches & pains elsewhere, friends & family needing help, looming deadlines, and more! No time left for writing here. Hopefully, eventually, I’ll manage to report here some of the metal-clay accomplishments buried in there. For the moment, however, here’s something I did last weekend: the return of Spring brings the return of Orienteering season too. Although the obvious question for the first photo here is, “What IS Alexis wearing? !” (and, since he’d set the course for this event, that should have been a clue of what we were about to be in for!) 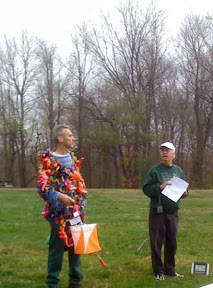 (plus, it’s a shame that Jim’s paper is hiding his nice orienteering club sweatshirt), the reason I include this photo is to illustrate what a “control” looks like: Note the White & Orange “flag” with its dangling red “punch.” That is what one is trying to find! The first event for this year was a “score” event, and was limited to 150 participants. Two friends and I went out as a team in the 3-hour version, to see how many controls we could find. There was a 6-hour option too, but we decided against that one. We are part of a variable group (different ones of us manage to make different meets) who attend these for fun, as pleasant exercise. We try to keep up a reasonable pace, but we are not among those who “race” the course. If someone wants to stop and take a photo, that’s fine. If someone needs to stop and rest a bit, that’s OK too. For us, it’s more important to enjoy the day in the country than it is to win the meet. Local meets are fairly inexpensive: the entry fee covers the cost of the map and a bit towards maintenance of the necessary supplies. Rarely are there any actual awards other than the personal satisfaction of seeing where you ranked. This course had 50 controls, 10 each worth 10, 20, 30, 40, or 50 points, spread across a park that covers around 7,500 acres. We set ourselves a route that included a handful of 10 and 20 point controls that we thought we could complete in the 3-hour slot: we could see that they were relatively close to the base, and we figured they wouldn’t require too much scrambling to reach. All I can say is: Control #5 should have been worth more than 10 points!!! Yeah, it wasn’t that far from the “base” site, but it was a challenge to even spot and, once identified, a real scramble to get to. We reached 20-point controls that were far, far easier! 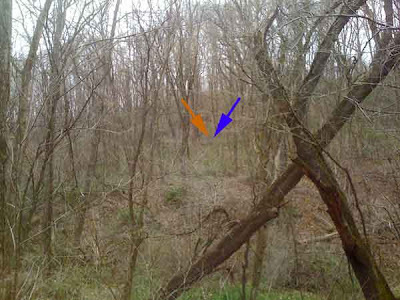 The second (small) photo shows a crossed pair of trees on the side of a path, and a hillside that’s farther off. It shows NONE of: the drop-off beyond those crossed trees, the stream, nor opposite bank one had to cross before starting up the hill. It DOES show Joan punching our scorecard at this control. You say you can’t see either her or it? For a clue where they are, I include a slightly larger image on which I’ve added an orange arrow pointing to the orange and white control flag, and a blue arrow pointing to Joan who was wearing a blue jacket and purple pants. Still can’t see either it or her? Control #5 should have been worth more than 10 points!!! The 20-point controls we did find, ones that were only slightly farther from the base, were far easier than this to simply see, let alone to reach… We found out that many other entrants either gave up looking for this one or, having seen it, figured they’d still do better by just moving on to another control. Since we weren’t that concerned about points, however, we decided to take it as a challenge: could we get those particular ten measly points. Despite my having pulled a hamstring ligament simply trying to find this one (which led to all sorts of complications the following week, though at last it seems to be on the mend), and with a big THANKS to our youngest member, Joan, we did! (Technically, only one team member has to actually reach the control and punch the score-card. Since Joan’s age pulled us down into a younger category, she was kind enough to volunteer to punch this one while we kept an eye on her for safety.) Every one we spoke with who did find that one agreed it was far and away the most challenging of those in its category. Since we didn’t even try to reach all of the 20-pointers, I can’t compare it to those with any authority; but, compared to the ones we did reach, I’d say this one should have been worth 30! Changing that point-value would not have changed our team’s ranking, so I’m arguing its value on principle only. We did manage to come in second in our category! This last photo shows our prize!! I note it because it’s the very first actual prize I ever got in this sport!!! We actually each got a prize! Silly as it is, I’m delighted. Now, it’s time to get back to claying and blogging and such. And, ummm, with knee on the mend, hopefully to my little, urban garden too.